InVue’s T1000 was covered as a major feature in the May/June issue of STORES Magazine. The story covers London Drugs‘ deployment of the T1000, InVue’s new push button dispenser, and the success they have seen in both improved customer service and sales. For the full story, read below, or click here for a PDF version. Like many retailers that offer small, high-value items, London Drugs has struggled with theft. To address shoplifting — particularly “velocity theft,” in which a criminal takes multiple units at a time — the retailer implemented a system that was “fairly successful from a loss prevention perspective,” says Tony Hunt, general manager of loss prevention. The downside? “It diminished our sales,” he says. Customers found it harder to access the products they wanted, and store staff found it difficult to re-stock the shelves. “As a result, we ran into out-of-stock situations that impacted the customer experience,” he says. With 80 stores across Canada, London Drugs focuses on pharmaceuticals, electronics, housewares, cosmetics and a limited selection of groceries. When Hunt and his colleagues looked for easy-to-use ways to limit theft, they came across the InVue T1000. InVue, a global technology company, provides merchandising, software and security systems. The T1000 was designed to help retailers “balance the sales and shrink equation” for hanging merchandise, says Karen Bomber, director of product marketing. It’s a delicate balance. Retailers want to place as much merchandise on the sales floor as possible. At the same time, the number of store employees is shrinking, which can leave products more vulnerable to theft. Retailers have had two choices for decades, Bomber says: They can lock everything up, either behind the counter or in shelf dispensers that can be cumbersome to use. The downside is an unwelcoming customer experience. If a product is locked up and no sales associate is available to offer help, customers are likely to walk out without purchasing anything. Another option is to put the products out with no security. In theory, this leaves merchandise available for honest customers. However, if the products are continually stolen, they won’t be available, either. 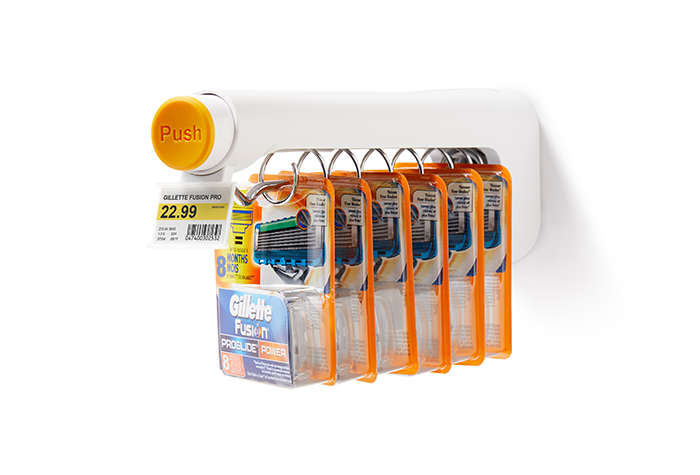 The T1000 is designed to combat organized retail crime theft of high-value, high-demand products like razors, batteries and skincare products. In an ORC theft, a criminal takes or “sweeps” multiple units of an item at a time, often with the intent of selling them later. According to NRF’s 2017 Organized Retail Crime Survey, ORC costs merchants more than $726,000 for each $1 billion in sales. Just as disturbing, retailers report that ORC gangs are becoming more aggressive. To access a product hanging on a T1000, customers must push a button, which then dispenses the item with a time delay. Although minimal, the delay is key, as it can dissuade criminals from engaging in ORC. When the Loss Prevention Research Council studied the T1000, it showed the product to 14 individuals who’d engaged in ORC. Nearly two-thirds said they wouldn’t steal a product protected by the T1000, with most citing the time required to access the merchandise. The T1000 “limits the risk of theft, but keeps the merchandise available and visible,” Bomber says. London Drugs decided to implement the T1000 in slightly less than half of its locations, starting with razor blades. “It would allow us to maximize the customer benefit and be easier for our staff, but would maintain the same level of shrink performance,” Hunt says. He says some London Drugs locations are greatly challenged by theft, and require an even greater security posture than that afforded by the T1000. Conversely, some stores with fewer problems could maintain completely open shelves. “The InVue T1000 has a sweet spot that maximizes sales and merchandising and is effective against a certain level of theft vulnerabilities,” he says. Although the product is intuitive, the London Drugs team created a video with support from InVue to help staff familiarize themselves with the technology. Most employees could hit the ground running with the T1000, Hunt says. Similarly, many consumers can figure out how to use the T1000 without any assistance. “They simply push a button and within a couple of seconds, the product pops forward and they can remove it off the dispenser,” he says. While the T1000 is larger than a commodity hook, it doesn’t take up any more space. Because of the way it’s designed, a retailer can place two T1000s next to each other, whether side by side or top to bottom. “We are planogram compliant,” Bomber says. Hunt says London Drugs’ deployment of the T1000 has been a success. The stores have enjoyed modest increases in sales and fewer out-of-stocks, while shrink has remained about the same. “It’s a net-positive contributor to the customer experience and our sales and marketing,” he says. The best measurement of the success of the T1000 is increasing revenue, Bomber says. The LPRC report found that sales of ink in a test store increased by 88 percent, while sales of shaving supplies skyrocketed by 144 percent. The study does note that the increase is not statistically significant, due to the small sample size, and that further study is required. The T1000 is being deployed in a range of retail environments, mostly for “high-value, desirable merchandise that’s small and densely packed on a wall,” including razors, pet supplies, batteries and small electronics, Bomber says. Hunt notes that while London Drugs has tested the T1000 on just one product, “we believe that this is a much more intuitive, customer-friendly” merchandising system than many of the other loss prevention tools available. One capability Hunt would like added to the T1000 solution is “annunciation.” That is, the T1000 would alert an employee if someone presses the button multiple times. However, annunciation requires power sources such as batteries, and these often strain a retailer’s resources. The T1000 was designed to eliminate that inconvenience while providing a simple, effective and low maintenance solution. London Drugs continues to review its deployment of T1000s to determine if it should expand its use of the device, both within the wet shave category and with other fast-moving, high-theft items that hang, either on their own or within a blister pack, Hunt says. “It keeps the product on the shelf in such a way that it’s highly available to the customer and looks good on the shelf, yet slows down velocity theft,” he says.